Don’t you want to make the most of your central heating and maybe do your bit for the environment? If you’re not familiar with power flushing then don’t worry we’re going to cover all the detail you need here. You might see power flushing is also advertised as jet flushing and hard flushing but they’re exactly the same thing with slightly different names. A power flush is when advanced plumbing equipment is connected to your heating system to get rid of any dirt or debris that’s blocking the inside of your pipes, boiler or radiators. But how does dirt get inside your radiators or central heating system? All water has a certain amount of dirt and debris suspended in it – it might only be microscopic but it’s there. Then you look at the metal pipes in your central heating system which will corrode ever so slightly over time. As the blockages get worse they can turn into a type of sludge that causes all kinds of problems with your radiators. 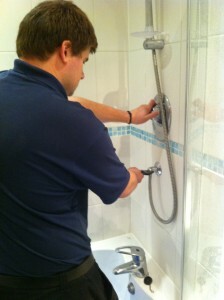 Then if your home has a problem with hard water then you could also have a build-up of limescale inside the same pipes. As these blockages get worse they restrict the amount of water flowing through your heating system and can lead to all types of problems – from low water pressure in your shower to far higher home heating bills than you’ve ever deal with before. So between the headaches and the expense power flushing is one of the best investments you can make in your home. And with ADI you’re getting more than just a domestic powerflushing service too – our engineers are trained and more than capable of also dealing with industrial and commercial issues too. We’re also more than happy to accept requests for our services from Housing Associations throughout the United Kingdom. So if your central heating system isn’t working as well as it used to or your boiler has started making some very odd noises then why not call ADI Plumbers FREE now on 0800 731 3848?